It was a 22 hour trip from Hiroshima to Osaka. We arrived about 12:30pm and tours started leaving by 1pm. Our tour didn't leave until 2:20pm, so I had time to get some local currency for a change. Unlike most of the recent ports that don't accept U.S. currency, Osaka sent an agent on-board to change money. That has been one of the problems with the Asian ports. Most do not accept U.S. currency and only large stores accept credit cards. Most of the stores at the port are small, temporary vendors who only accept local currency. It was raining today so we were debating on whether to go on the tour or not. The rain slowed to a drizzle before our tour time so we finally decided to go. We are very glad we did. 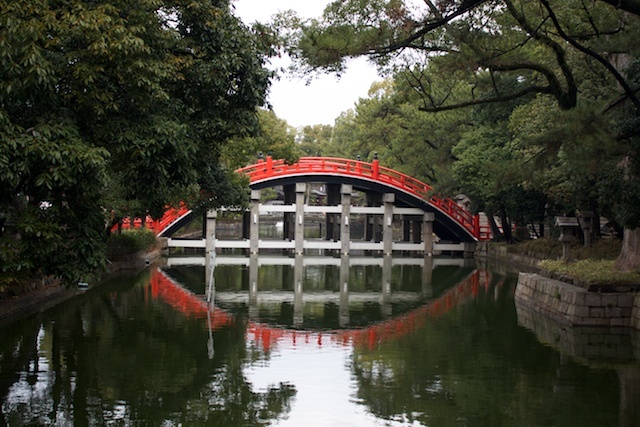 Our tour was to the Sumiyoshi Taisha Shrine. At previous ports we saw Buddhist and Taoist temples, but this was our first chance to see a Shinto Shrine. 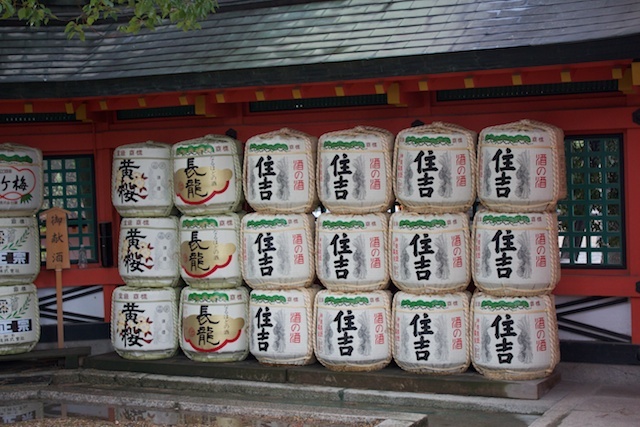 The Shinto religion is only practiced in Japan. Although translation of these concepts is hard, my understanding of what our guide said is this. 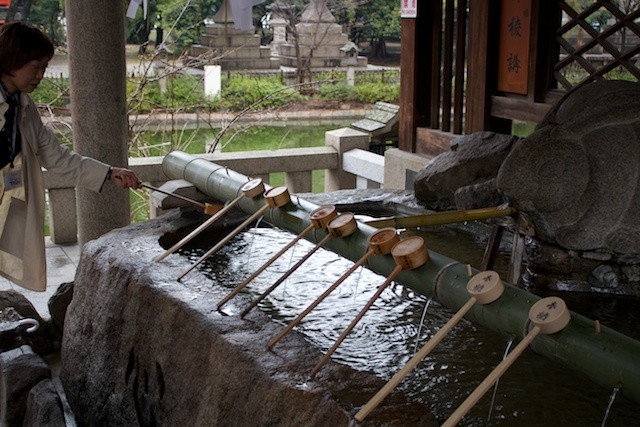 Shinto practitioners believe in 8,000 gods or "kamis." These relate to the forces of nature. There are kami of the sea, wind, trees, lightning, thunder, etc. The shrine we visited was originally built to pray for safe passage on the seas. However, over the years people began coming to this site to pray to all the other kami too. It got very crowded near the one shrine so they built additional buildings for the other gods. 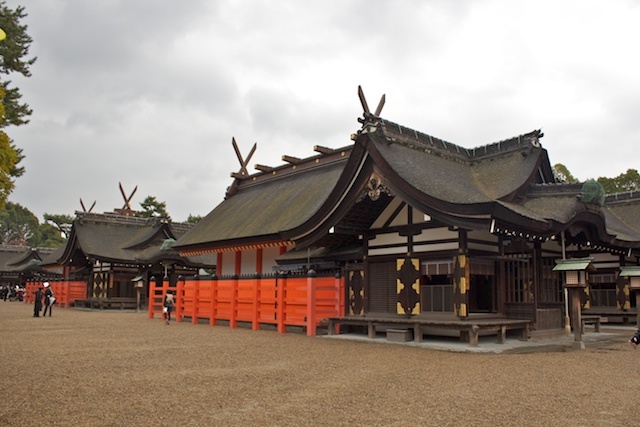 Although burnt down and rebuilt several times over the centuries, there has been a shrine here for over a 1,000 years. I believe the current buildings date from the 19th century. We only visited a few of them. Our guide showed us how to pray for a safe voyage to the imi of the sea. We also visited a tree shrine and a shrine for businessmen praying for success in their business. 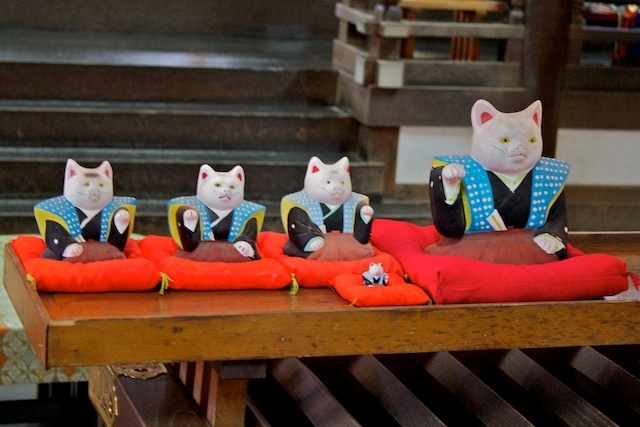 A common theme for business success throughout Asia is a statue of a cat. Having one of these in your business is supposed to bring the money in. The ones in this shrine were stationary, but in other Asian countries they all had one arm that moved up and down, waving the money in. We had two treats while visiting this shrine. 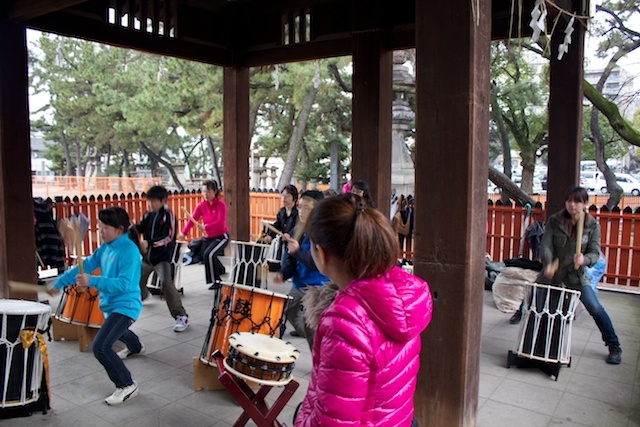 When we first walked in we found a group of children playing traditional drums. Our guide explained that they were practicing for an upcoming competition. We got to stay and listen to the a few minutes and they were great. The second treat was that we encountered a Shinto wedding ceremony and were able to take a few photos of the bride and groom. 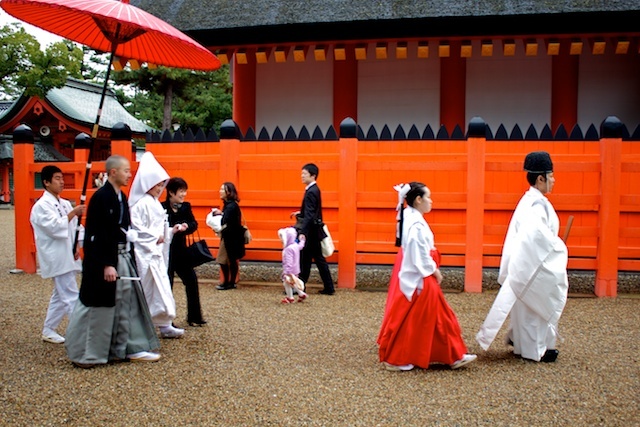 The groom was dressed similar to the groom we saw in Hiroshima yesterday, but the bride was dressed very differently. The Hiroshima bred was dressed in a colorful, elaborately embroidered kimono, while this Osaka bride was dressed in a white kimono and had on a distinctive hat. I wasn't able to ask the guide why the difference, but plan to ask Sandra Bowern if I get a chance. Today was Ray's birthday, so we had reservations at the steak restaurant onboard, "Prime 7." After an excellent surf and turf dinner, the waiters brought Ray a cake with one candle to blow out and wished him happy birthday (without any embarrassing singing). Birthdays and anniversaries are also announced on the ship channel on TV and Ray received that birthday wish this morning. When we got back to our room, the room attendants had decorated the room with a happy birthday sign, balloons, and a towel dog. Ray really liked that and went out to find the attendant and thank her. After dinner we also had to check in with Japanese immigration again. This was our last port in Japan so they collected our shore passes and stamped our passports with exit stamps. The ship's crew then collected our passports again. So far, Japan has been the most stringent in immigration requirements of all the ports on this trip. Our next stop is in Seoul, South Korea, so it will be interesting to see what they require.